Jose Filipe Torres, CEO of Bloom Consulting with headquarters in Madrid (Spain), in this post tells us about the key findings from the 2017 Country Brand Rankings for Tourism and Trade, published by Bloom Consulting a few weeks ago. He also discusses the winners and losers, and global trends. Jose, which findings of the Country Brand Ranking 2017/18 did you find the most intriguing? As usual, we published two editions of the Country Brand Ranking© 2017/2018: The Tourism edition and the Trade edition. The most intriguing finding of the Country Brand Ranking© 2017/2018 is that more Asian countries are represented in the Top 25 of this year’s Tourism edition, compared to previous editions. Countries such as Thailand, Hong Kong and Australia have shown a strong performance. European countries, on the other hand, are showing a weaker performance, as the number of European countries among the Top 25 of both of rankings has decreased over the past years. While Europe is still perceived as the most important tourism region by global citizens, important tourism destinations like Spain, France and Germany have moved down in the ranking. In the Trade edition, the Americas have been showing a particularly strong performance. The USA, Brazil and Canada have all proven that they rightfully belong in the Top 10 of the Ranking. 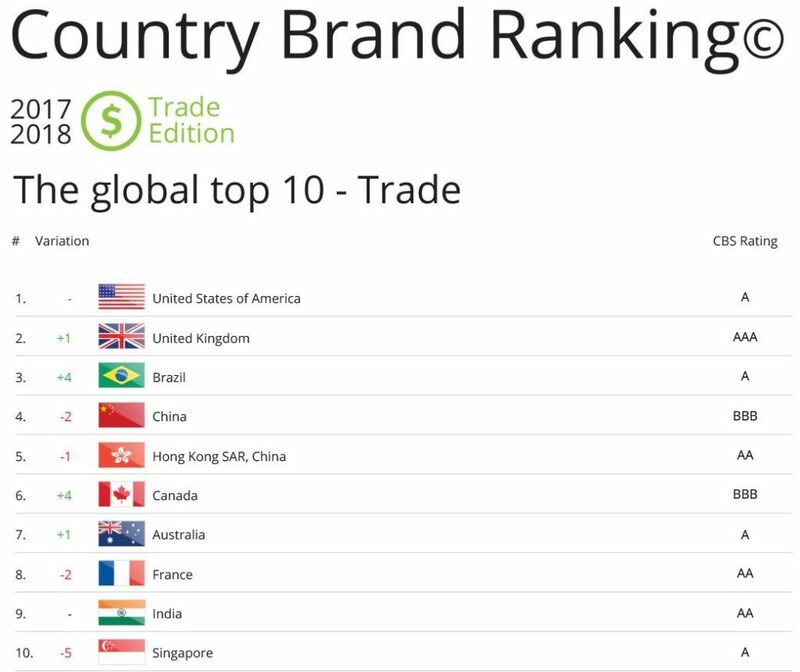 While the USA managed to defend its position in the 1st place, both Brazil and Canada moved up by four positions, which are the strongest increases within the Top 10 of the Trade Ranking. As I’ll explain in more detail in question 4, the Country Brand Ranking does not directly measure the perceptions that global citizens have of a country, but the impact that these perceptions have on the country brand. 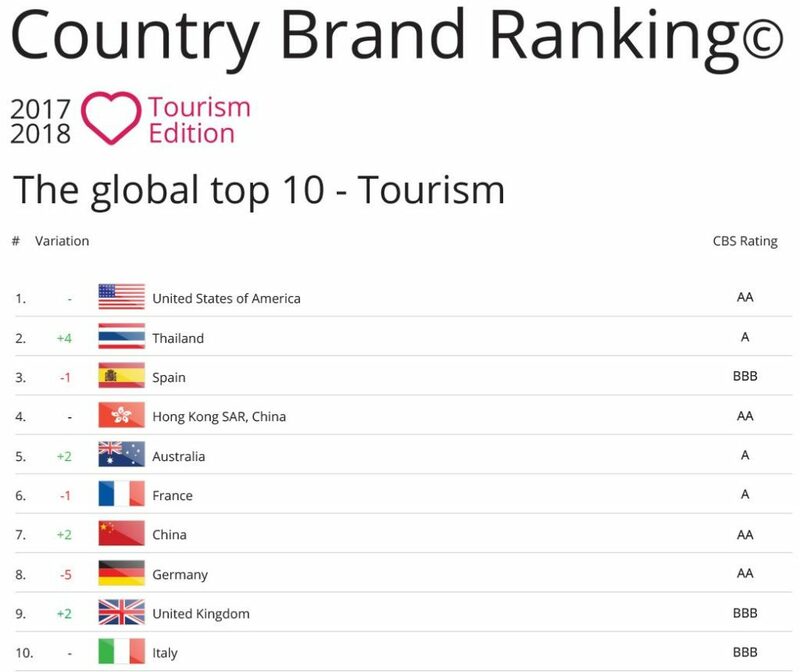 In the Tourism edition of the Country Brand Ranking© 2017/2018, especially the runner-up, Thailand, stands out. Thailand moved up by eight positions and secured itself 2nd place. This is due to increasing tourism receipts and strong Digital Demand – D2© results. The country’s tourism industry is expected to keep booming. Therefore, Thailand could potentially be overtaking the USA in the ranking in the near future. If this happens, it would be historic, as the USA has always taken the first spot since the first edition. In the 25th-50th range of the Tourism edition, Peru, Costa Rica and Vietnam stand out for their impressive performance. Peru improved by eleven positions and is currently in the 41st place. The country is clearly speeding up the ranking, as it had already increased by twelve positions between 2013 and the 2014/2015 edition of our ranking. Watch out for Peru. Costa Rica managed to move up from 58th to 46th position, which is an incredible twelve-position leap. After a ten-position increase, Vietnam positioned itself in 47th place, right after Costa Rica. Both Brazil and Canada have shown an impressive performance in the Trade edition of the Ranking, gaining four positions respectively. Brazil has been climbing up the Ranking since 2011 and has now secured itself a place in the 3rd spot. The country’s success is driven by its strong social media performance, high Net FDI scores and strong Digital Demand – D2© results. This is astonishing considering the numerous political scandals which were uncovered in the country recently. Canada currently ranks in the 6th position of the Trade Ranking and has impressed with an incredible Net FDI and Digital Demand – D2© growth, and with its competitive online performance. This is in part also linked to their popular Prime Minister, Justin Trudeau. It can be expected that Canada will be able to maintain or even improve its positioning in the Ranking in the near future. In the 25th-50th range of the Trade edition, the Philippines showed the most impressive performance: In 2013, they ranked 77th, and in the 2014/2015 Ranking were in the 48th position. In the most recent Ranking, the country jumped another 2 positions and secured itself the 46th place, Let’s see what will be the impact of President Duterte, who assumed office last year. Portugal has also proven that it is a strong competitor, as the country moved up eight positions in comparison to the previous edition, ending up in the 30th spot. Furthermore, both Luxembourg and Ireland managed to enter the Top 25. Luxembourg moved from the 32nd to the 24th position and Ireland impressed with an incredible twelve-position leap to the 14th place. Within the Top 10 of the Ranking of the Tourism edition, Germany (surprisingly) has experienced the strongest decline. The country moved down the ranking by five positions, now in 8th place. Although Germany has not been performing badly (they have a solid Country Brand Strategy Rating© and have received high tourism receipts), the country has not been growing enough to keep up with the fierce competition. In the 25th-50th range of the Tourism edition, the United Arab Emirates had the weakest performance, having already fallen by nine positions in the 2014/2015 Ranking, compared to the 2013 Ranking. The latest edition of our Tourism ranking sees the UAE on 44th place. If they do not take caution, they will bid farewell to the Top 50 altogether soon. Singapore (surprisingly… also) is the country which has been experiencing the strongest decline within the Top 10 of the Trade edition. Although Singapore seemed to be on a promising rise in the last edition of the Ranking, the country could not keep up with the competition and lost five positions in the newest edition, now in the 10th place. Singapore was especially unable to compete with the high Net FDI growth of its competitors. The weakest performers in the Top 25-50 of the Trade edition were Japan and the Ukraine, which both fell by ten positions. While Japan is now in the 41st position, the Ukraine fell to the 44th spot of the Ranking. How does the Bloom Country Brand Ranking work in terms of methodology? It is important to highlight that the Tourism and Trade editions of the Country Brand Ranking do not directly measure the perceptions that global citizens have of a specific country brand, but the impact that these perceptions have on a country’s brand. Each variable has a different weight in the overall score. Variable 1: The Economic performance of a country’s tourism and trade sector is an important variable in the Country Brand Ranking. A country brand cannot be strong in tourism or trade if the country does not achieve any economic gain from international visitors or business people. For the Tourism edition, we take tourism receipts (arrivals) into account, whereas we consider Net FDI inflow for the Trade edition. Hard data concerning the economic performance of a country within a specific dimension is only available for tourism and trade. That is why we are currently unable to publish any rankings for other dimensions, such as export, talent or prominence. Variable 2: Furthermore, it is important to measure the appeal, the demand for a country. We do this by using our proprietary Digital Demand – D2© software. D2© enables countries to find out who is searching for them at what time of the year from which country. Therefore, a country’s Digital Demand – D2© is an indicator of its appeal. Variable 3: The Country Brand Strategy Rating© evaluates the accuracy of the strategic positioning of National Tourism Organizations (for the Tourism edition) and Investment Promotion Agencies (for Trade). We evaluate their strategic positioning by comparing the most popular Brandtags (as measured with the Digital Demand – D2© software) of a country to the Brandtags which the National Tourism Organization or Investment Promotion Agency most strongly promotes. Variable 4: The online performance of a country is comprised of its performance on Facebook, Twitter and Instagram. Social media platforms are increasingly impacting the perceptions that people have of a country, which is why it is indispensable to include these platforms in the analysis of the strength of a country brand. The same I have mentioned in question 1 – the trend that Asian countries are on the rise, whereas European countries are slowly losing momentum. It may be too soon to reach a conclusion, but it seems that, at least for tourism, this is truly the Asian Century. This is a surprising result, as most people would expect Asian countries to perform particularly well in the Trade ranking (where they are mostly average), and not necessarily in the Tourism ranking. Europe, the “Old Continent” is clearly struggling to keep up with the growing competition in both the Tourism and Trade rankings. Read our interview with Jose Torres here. Download: Tourism Ranking | Trade Ranking. 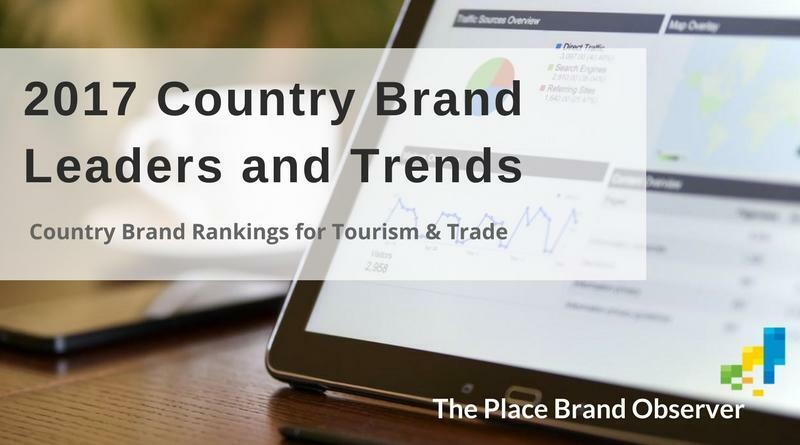 Enjoyed this update by Jose Filippe Torres of Bloom Consulting on 2017 country brands for tourism and trade? Share and spread the word!